How Many Menhaden Do We Really Need? The Atlantic States Marine Fisheries Commission (ASMFC), a consortium of 15 states from Maine to Florida, manages the fisheries for part of the Chesapeake Bay and for waters 3 to 200 miles off the East Coast. Created in 1942, the ASMFC is essentially the most important watchdog for—and sets and restricts the harvest levels of—a variety of fish, including the lowly menhaden, a small, oily baitfish that lies near the bottom of the food chain. Today the harvest levels of the humble menhaden are the focus of much scrutiny and debate. Just about everything consumes menhaden, including stripers, flounder, tuna, crabs, and even pelicans. Menhaden are a major source of nutrition for a whole host of sea creatures in the Chesapeake Bay (and up and down the entire Eastern Seaboard). Because they are such a crucial link in the food chain, many view menhaden as a bellwether species, the health of which provides insight into the overall health of the Chesapeake Bay. 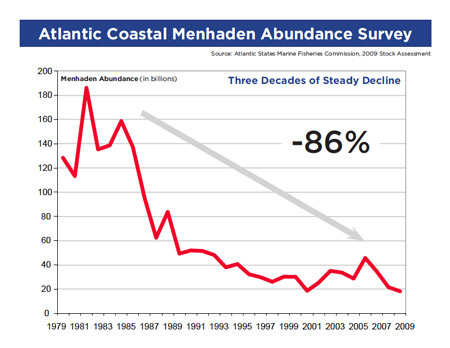 And that is why stakeholders greeted the news that the ASMFC’s latest stock assessment put menhaden spawning potential at just 8 percent of an unfished stock—a historically low level—with such despair. Texas-based Omega Protein, the largest commercial harvester of menhaden in North America, has a processing plant in Reedville, Virginia. The company harvests about 240 million pounds of menhaden annually from the Chesapeake Bay using spotter planes and ships. These commercial vessels can nets as many as 50,000 menhaden at a time. The fish are then processed into a host of products including heart-healthy supplements, feed for dogs and swine, and ironically, commercial fish food. Incidentally, Omega Protein is not the only commercial angler putting pressure on the menhaden fishery. Bait boats also gather menhaden for lobster traps and tackle shops and account for nearly 20 percent of all menhaden harvested. Because baitfish stocks in general appear to be in decline, tempers are flaring in New Jersey, where no limits have been imposed on harvesting menhaden as bait. Commercial bait fisherman from New England, unable to fish for river herring because of a moratorium put in place by the ASMFC, have seasonally shifted operations to New Jersey, where 30 million pounds of menhaden were harvested by bait anglers last year alone. Conservation groups like the Herring Alliance and the Chesapeake Bay Foundation along with many recreational anglers have recommended that the ASMFC adopt a position called “Option 2,” which suggests raising the maximum spawning potential of menhaden to 15 percent. The argument from the pro-Option 2 crowd is that if more menhaden are left in the Chesapeake Bay to reproduce in the first place, then they should produce more menhaden. If adopted, this option might require significant reductions in menhaden harvest levels, much to the chagrin of commercial harvesters. Each state sends three commissioners to the ASMFC, though the commissioners cast just one vote. And they’ll be exercising that single vote on behalf of the menhaden fishery very shortly now: The ASMFC will hold a final public hearing in Boston on November 2. Anglers who wish to weigh in on the issue may contact their respective commissioners here.